Sheets of plywood available in different sizes and actual width, length and thickness depend on manufacturer’s product line and plywood type. But most local retailors offer only a few standard sheet dimensions which typically 4 feet in width and 8 feet in length or smaller as a stock option. Bigger odd sizes available from manufacturers as well, they just not commonly used and might cost more. Chart represents most common plywood sheet sizes in inches (imperial system) and millimeters (metric dimensions). *Most of plywood sheets available in different thicknesses. Softwood plywood typically used for rough framing comes in 4 x 8 feet (1220 x 2438 millimeters) sheets. Even though with all variation often 3/4” (19 mm) nominal (23/32”) thickness tongue and groove flooring boards will be allowed to use as a rough subfloor according to building codes. In some application 5/8” will be still acceptable. Roof sheeting might be done with thinner 1/2” or, in some cases, even 3/8”particle boards under asphalt shingles. But heavier roofing materials including slate or concrete might still require 3/4” plywood installation or (and) building some additional supports for rafters. Plywood is available in different grades – A, B, C, and D. A-rated products are the finest with decreasing in quality and the most defects allowed in D category. Sheathing pressure-treated 4’x8’plywood which might very in thickness from 1/4” to 3/4” widely used for different outdoor applications. Sanded oak plywood with actual dimensions 2’x 2’, 2’ x 4’, 4’ x 4’ or 4’ x 8’ very is typical for use in indoor applications. Some properly finished sheets with a smooth surface might be used by a carpenter while building some decorative wood elements around the house. Thinner plywood easy to bend and might be a perfect solution for finishing wooded arches or other round-shaped objects. Type and quality of plywood will certainly determine the price at a first place. But identical thickness and overall properties plywood in bigger sheets will typically cost less per square foot than smaller pieces. It is always be cheaper to buy one 4’ x 8’ sheet and cut it comparing to paying for four 2’ x 4’ pieces. The weight of a plywood sheet will proportionally increase with increasing in width, length and thickness. 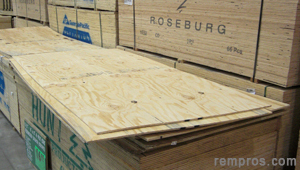 3/4 thick plywood will weigh about 2.5 pounds per square foot (PSF). And the whole 4’ x 8’ sheet will be approximately 84 lb. or 38 kilograms. But still depending on a type and wood species used for plywood production variations in weight might be +/- 15% even though actual sheets dimensions will be identical.